One of the biggest issues with cancer is something that does not get talked about much, and I’m not sure why. It is the cost of fighting the disease, and the effect of those costs on the patient, the patients family, and the general quality of life of the cancer survivor. I suspect one of the reasons it doesn’t get talked about much is because when cancer throws you into financial distress, it’s embarrassing. As a full grown, independent human being, you want to be able to pay your bills. And, when that gets difficult, or even impossible, it’s stressful, and will also bring with it a great big helping of shame. We’ve been lucky that I work for a company that has a decent health plan. But over the years, the deductible keeps rising, and if you know anything about fighting cancer, you know that you’re going to be hitting that deductible every year. And that does not include any prescriptions that may or may not be covered. I’m not gonna get into the nuts and bolts of every penny that I pay in fighting this disease, my purpose with this blog is just to give you an overview of the stress it puts on the survivor, the caregiver, and the rest of the family.And when big stuff breaks, it hurts. We have been on a regular maintenance plan with a heating and cooling company over the past few years. They come out twice a year and give our furnace and air conditioner tune ups. They change the filters, check out how things are going, and generally make sure everything is okey-dokey with a couple of appliances that are very expensive to fix. Over the years, the technicians that have come to the house have had a common theme. The furnace is old. It’s over 25 years old and it’s only a matter of time before it gives up the ghost. And when that happens, it’s gonna be an expensive day. Well, guess what? That day is today. I noticed last week that the furnace was running a lot, and generally taking a long time to get the house up to the temperature we desire. So, yesterday the tech came out to look at it and give it a check. And the news he gave was not good. The furnace was getting to the point where it was dangerous to run. He showed me on a meter that the outside exhaust, which is supposed to be under 10 parts per million of carbon monoxide, was up over 8,000. Yeah, that’s not good. It was also running very hot on the outside skin of the furnace itself, so it was a fire hazard. So it was pretty much a no brainer that a new furnace was going to have to be installed. So, today, I’m sitting in my living room watching two gentlemen take out the old and put in the new. C’est la vie mon ami. Here’s the thing. The fear of the next thing to go wrong, whether it be a furnace, or a car, or a refrigerator, or any other big thing in your life that could break at anytime, is palpable to a cancer patient. I drive a 16 year old Nissan Pathfinder. I love the car, it’s paid for, and it does what I need it to do. But it has over 200,000 miles on it. Once again, like the furnace, it’s only a matter of time. I had a scare last fall when a wheel fell off while driving on a neighborhood road. My first thought was, that’s it, it’s time to get a new car and immediately freaked out. Turns out when I got new tires, the kid that put the tire on cross threaded the lug nuts, so any damage and any cost that were incurred when the tire fell off were covered by the tire shop. Whew. But that incident, and now the furnace, are indicative of the kind fear a cancer patient has to live with every day. It’s not just the fear of a bad test result, or the fear of a treatment that stops working. It is also the fear of going broke trying to stay alive. Holly and I shed a few tears yesterday, and it’s not because we were emotionally attached to our old furnace. It’s just that the furnace dying put another level of stress in our lives, and it’s another payment that we will have to push out for years in order to lower the monthly cost. We live in an older home. These costs are inevitable. But my treatments put pressure on everything that happens. I feel very fortunate to be alive and also that I’m still able to go to work. I thank God everyday for the kind of medicine that can help me live a longer life, and I’m thankful for friends and family that have helped us out from time to time. But after fighting this thing for the past 9 years, this is getting old. I’m sick of living this way. We are trying to remodel a few things around the house, and trying to do it ourselves, but most days when I come home from work, I’m cooked. I need to work in order to pay the bills and get the health insurance, but I don’t really have the energy to do much else. The one thing I can still do is take Zoey out for walks, which helps keep me healthy by keeping my weight down, and the walks also do a lot for my mental health, but standing in my kitchen painting for a few hours is pretty difficult. Look, I’m really not looking for pity here, although just reading what I wrote seems pretty pitiful. I just want you guys to know what it’s like to go through this crap, and that part of the fight has nothing to do with the actual disease, and has more to do about the stress that the disease puts on families financially. And I’m not going to get into the politics of possible solutions either. My concern is what is happening right now to families all over the world, and what they have to go through to survive. Maybe in the next couple of blogs I’ll get into the politics of it all, but I don’t really want to. I just want to be able to pay my bills, live my life the best I can, and have a warm house to live in. When you live in Michigan, even in April, that’s pretty important. The guys at Vredevoogd Heating and Cooling did a great job! And they liked Zoey! Looks like the guys are wrapping up. 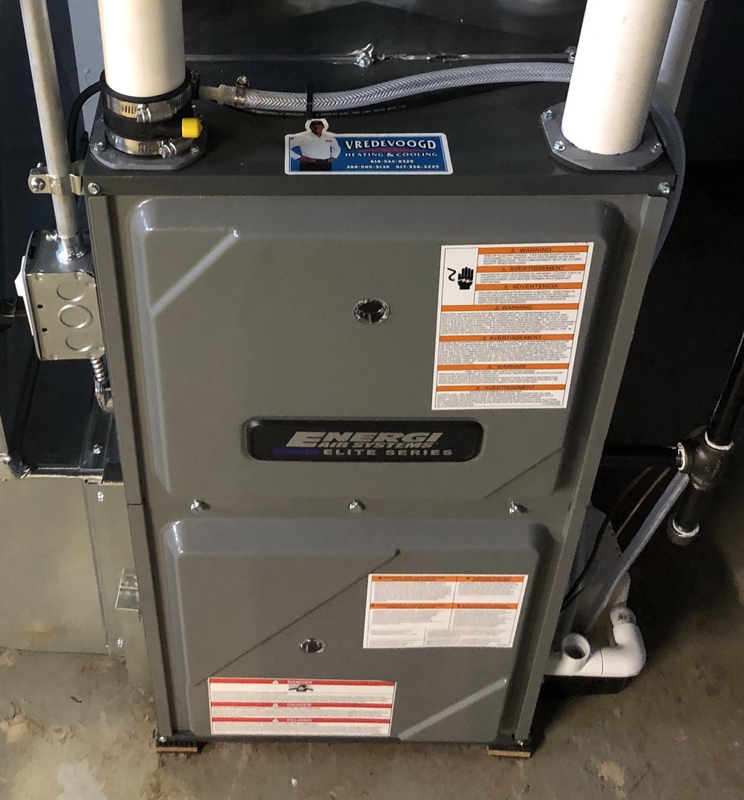 Hey, a new furnace! So exciting. Enjoy your blog, keep up the fight. The cost issue is always there, cancer is big business. In my last years of work the company switched to a high deductible plan ($5000/yr), but I only had three years to work and the company was generous with HSA contributions, so at 64 I had 10k in my HSA, well the DaVinci robot in August ate up $5,000 and 40 IMRT jolts in January ate up $5,000, so good bye HSA nest egg. Post surgery pathology done by a out of network pathologist (how was I supposed to know that? $2,000), then finally reached medicare and a supplement plan have controlled the out of pocket hits since. I am thankful that everything that was done has worked, and I’d pay it again, but the money flows out very fast. One thing is for sure, we live in the same parallel world. Leak in the plumbing called a well know plumbing company cost $5000 wanted to re-plum the house $15,000. Knocked out the slab to fix the leak, put a large hole in the wall, knocked out tile on the adjacent bathroom. They walk in look around and it cha- Ching. Anyways great blog, we feel your pain. Dude, I got a 99 Pathfinder I paid $ 750 for last summer. Spent all last summer traveling backcountry roads beating the crap out of it. A couple months ago a couple lug studs broke and as these things go ended up replacing the front bearings as well myself though that process took weeks and involved considerable cussing. Mine only has 260k and running strong though the front end is a little creaky. Walcott was blessed to take a short ride in this vehicle and was duly impressed lol.